June | 2015 | "An Adventure in Democracy"
In these Cold War-ish days of heightened American-Russian tensions, it’s worth remembering a time when we stood shoulder to shoulder against the common enemy of civilization, the scourge of Nazism. 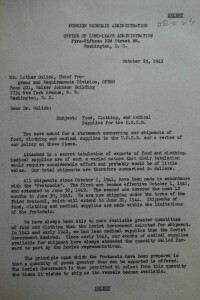 That era is memorialized in the Luther Gulick papers of the Institute of Public Administration Collection. 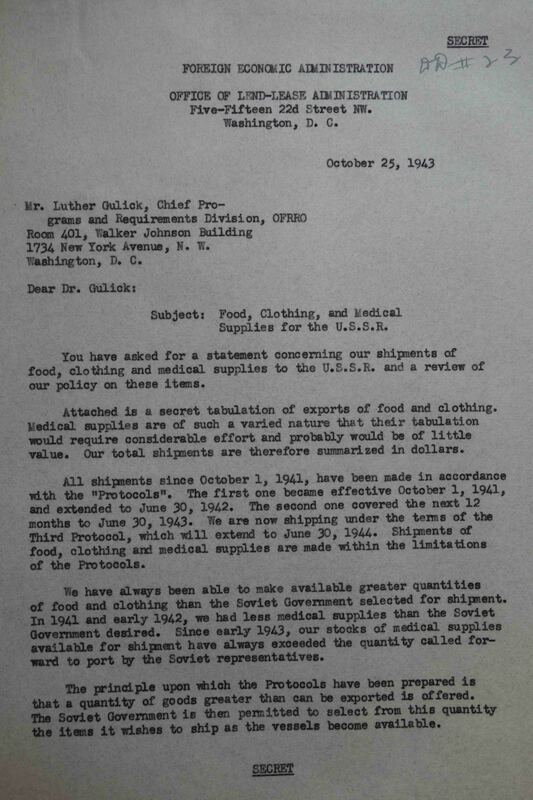 Gulick, called to Washington from his IPA offices in New York, served and directed an alphabet soup of FDR’s wartime agencies, including the Office of Foreign Relief and Rehabilitation. 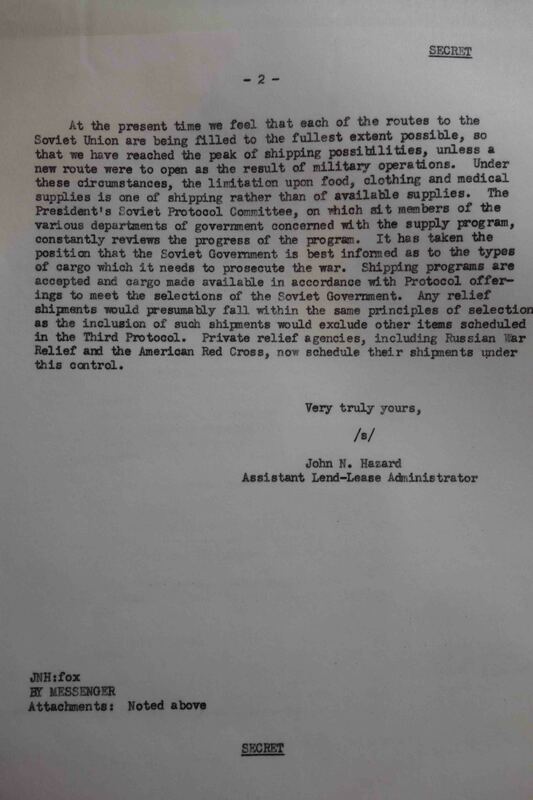 Which is where we find him on October, 25, 1943 when the Office of Lend Lease Administration writes him as chief of the OFRR’s Programs and Requirements Division to report — secretly, of course — on the aid Roosevelt is shipping Stalin to withstand the German onslaught. 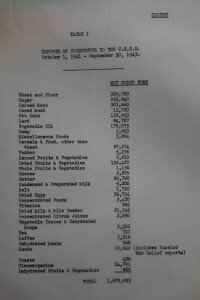 From October 1, 1941 to Sept. 30, 1943, it totaled $22 million — in today’s dollars $302,410,000. Not all Uncle Joe wanted from his Uncle Sam but hardly a pittance either. Indeed, it was money well spent. The Red Army and populace took the brunt of Hitler’s aggression, at a horrific cost in lives and property. 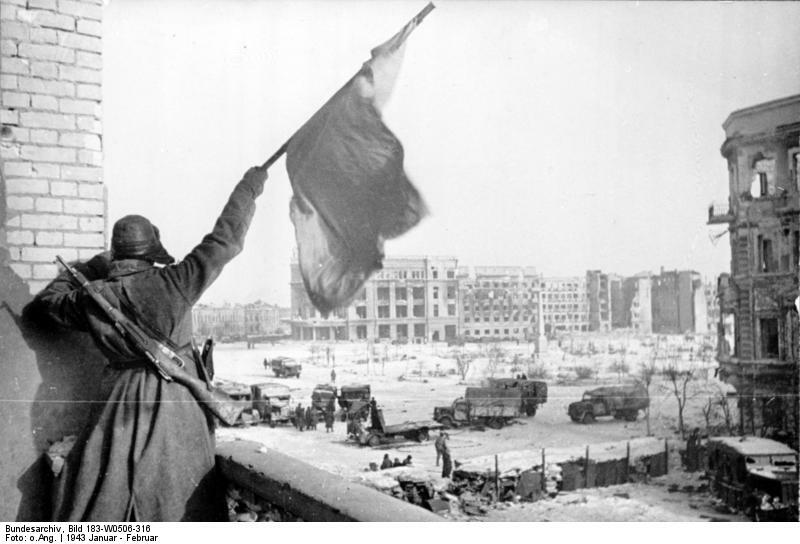 But their brave resistance bled the Nazi forces as well, halting their rampage before it could be fully turned against England and the West, thereby changing the fortunes of war and all history. We give thanks, to be sure. So what did America give the Russians? 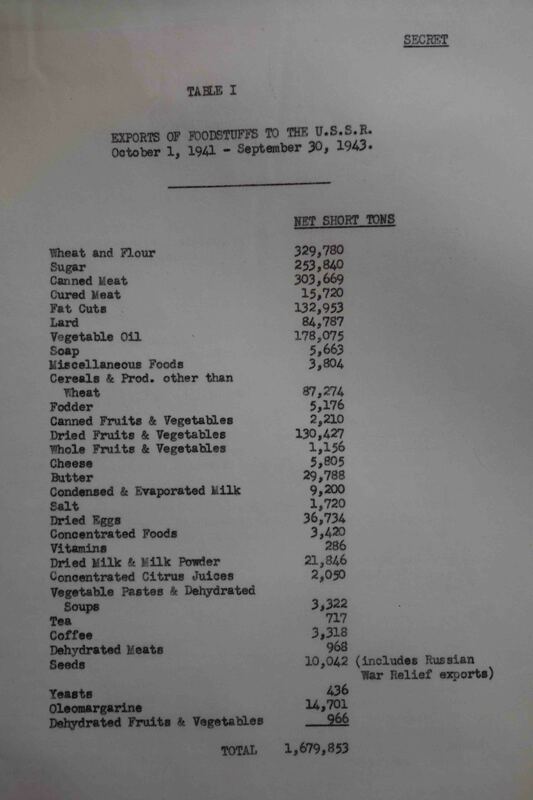 Food: almost 330,000 net short tons of wheat and flour, 254,000 tons of sugar and 303,000 tons of canned meat, among other foodstuff — a total of nearly 1.7 million tons of nourishment. 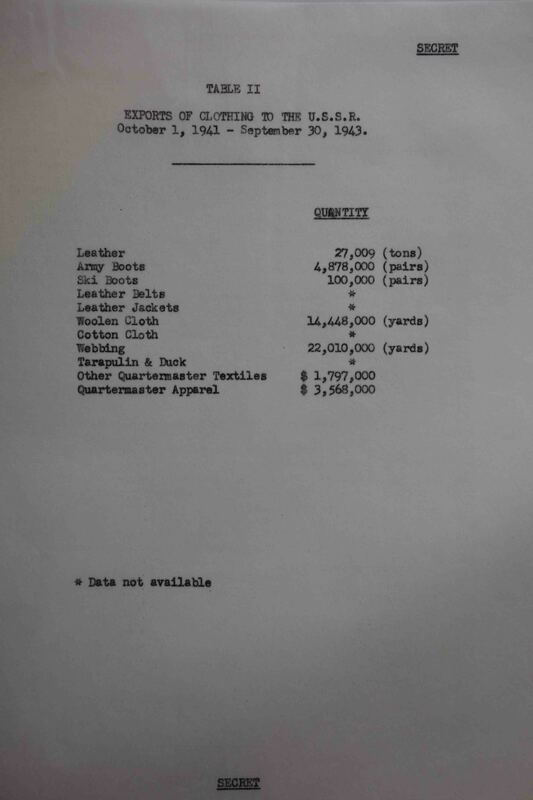 Clothing: 14.5 million yards of woolens, 27,000 tons of leather and nearly 4.9 million pairs of boots. 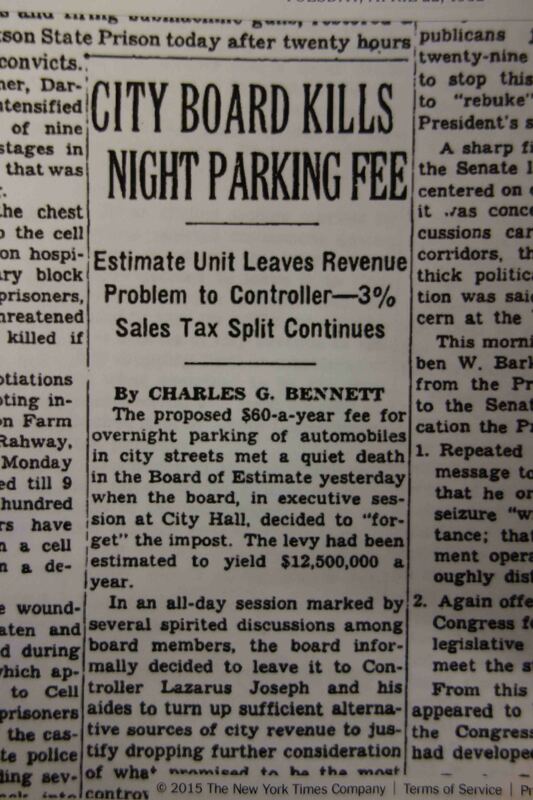 Looking for ways to raise city revenue back in 1952, New York planners floated a bold scheme: charge car-owners to park on the street overnight. Predictably, it set off an uproar, before dying repeated agonizing deaths. Plural. 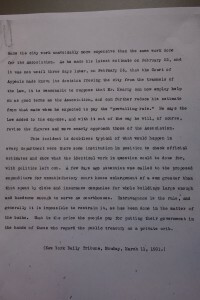 The story emerges in news clippings and files of the Mayor’s Committee on Management Survey, that mouthful of municipal MEGO (my eyes glaze over) with the worthy purpose of modernizing New York’s antiquated government to meet the challenges of a fast-changing postwar world with its urban congestion, crime, and commuters. The panel spanned the mayoralties of William O’Dwyer, Vincent R. Impellitteri and Robert F. Wagner and was, of course, directed by our own Luther Gulick. Gulick soon recruited a kindred spirit, Lyle C. Fitch, a native Nebraskan, economist and fellow policy wonk. 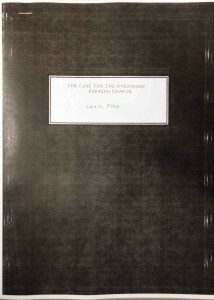 Fitch would succeed Gulick as New York’s second City Administrator, and later president of the Institute of Public Administration, and would become Gulick’s devoted if worshipful biographer with “Making Democracy Work” (Institute of Governmental Studies Press, University of California, Berkeley, 1996). But Fitch was eminent in his own right, “a prescient analyst of the fiscal and administrative problems of cities and governments,” as The New York Times recounted when he died at 83 in 1996 (almost four years after Gulick.) Fitch also liked to say he was the only public official in New York who could rope, tie and brand a calf. Fitch’s brother, Val, was no slouch either. A Nobel laureate in physics, he had worked on the Manhattan project developing the atomic bomb. “The Case for the Overnight Parking Charge,” a 19-page report marked Confidential that Fitch delivered to the Mayor’s Committee on April 10, 1952, called street parking a valuable “privilege” that car-owners should pay for. That included overnight parking. As proof, he noted that garages charged as much as $30 a month ($269 in current dollars, yet still amazingly cheap by today’s standards). Fitch suggested a charge, or tax, of $5 a month ($44 today), or $60 a year ($538), to park overnight. That was calculated to raise $12.5 million a year ($112 million today) and would have the added benefit of keeping more cars off the street and facilitating street cleaning. “How much would New Yorkers be willing to spend to have clean streets instead of the present shamefully dirty ones [? ]” he wrote. According to Sanitation Department calculations, where parked cars occupy more than 50 percent of curb space, the extra cost of street cleaning amounts to $76 per curb mile per day, ($682 today. ) 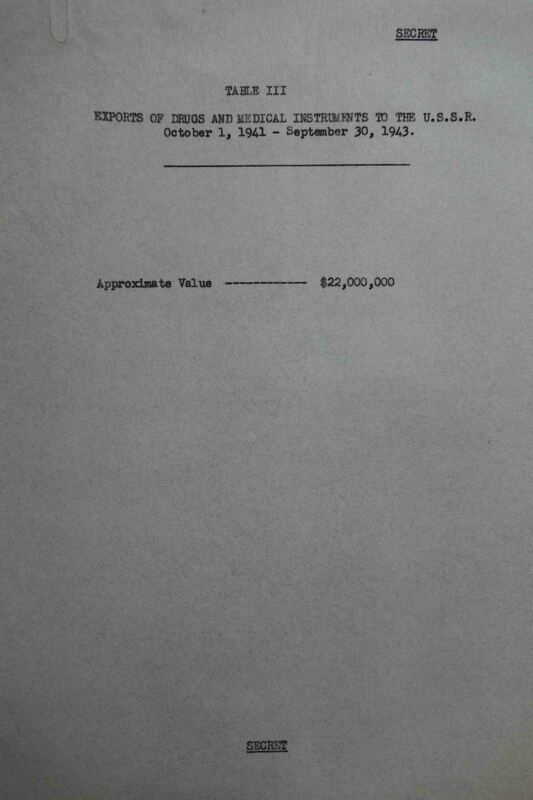 Total extra cost to the city, every year, in today’s dollars: about half a billion dollars. The city had yet to adopt comprehensive day-parking restrictions, so all-night parkers were often all-day parkers as well. Other cities taxed motorists more than New York, Fitch wrote. Milwaukee charged a $4 nightly parking fee. But wait! 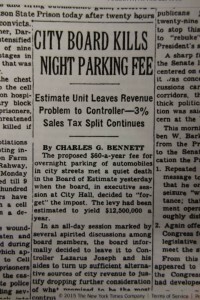 Two years later, with Wagner now mayor and Gulick his City Administrator (a post that Gulick’s committee on management survey had urged), the overnight parking fee rose from the grave — only to be quickly buried again. It sprang to life anew in 1959 — when Fitch was deputy City Administrator, and once again was hammered into its coffin. 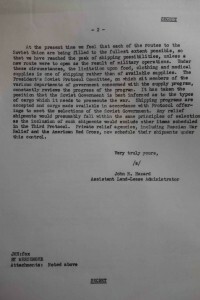 In 1969, a newly reelected Republican fusion mayor, John V. Lindsay, asked a hostile Republican Legislature for taxing authority to impose the overnight parking fee, among other duties, to subsidize the city’s 20-cent transit fare. (Really? Twenty cents!) The lawmakers responded that the city had long had that authority but never used it. Lindsay, like the mayors before him, left it for dead. We’re all familiar with “Six Degrees of Separation” — how everyone and everything is connectable in six or fewer steps, a chain of relationships that binds the cosmos, or so the theory goes. 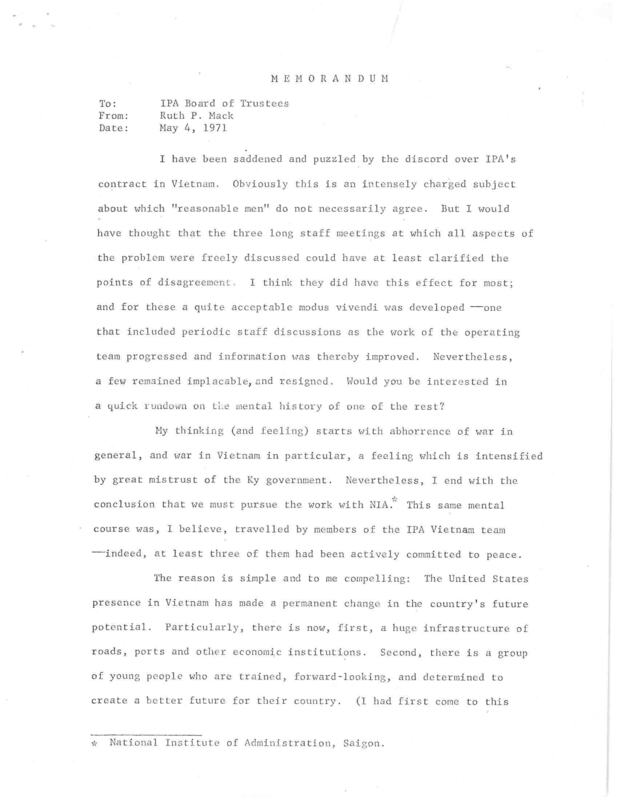 In this way, Gulick, Vietnam and extraterrestrials are definitely related. We know this from our research, where lines of inquiry can cross in the strangest of ways. 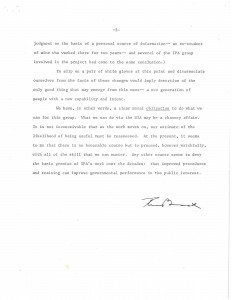 So when Ruth P. Mack turned up prominently in the files of our Institute of Public Administration Collection, we experienced a shock of recognition. 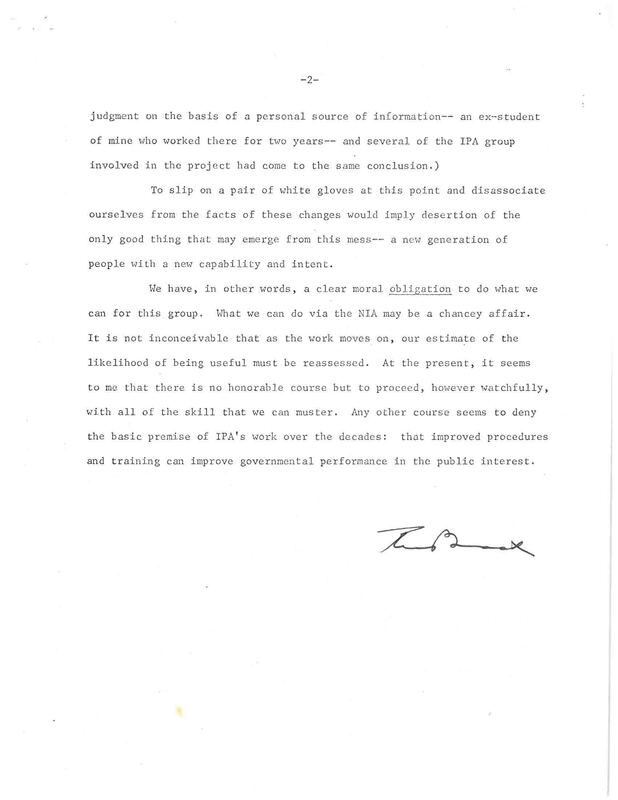 In October, 1971, according to a memorandum in the IPA files, Ruth Mack weighed in on a bitter controversy that had split the organization. 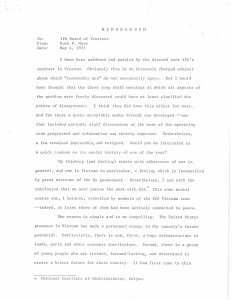 IPA had taken on a contract to advise the National Institute of Administration in South Vietnam. 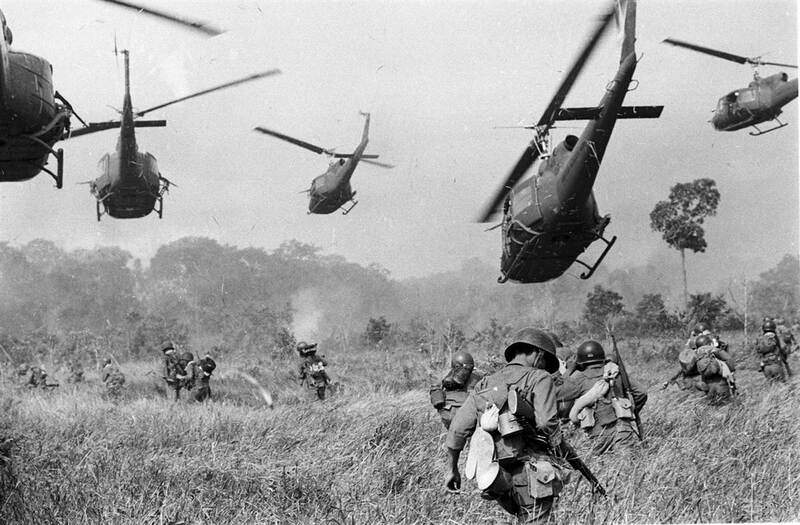 The war was raging, to violent protests across America, and ultimate victory by the North Vietnamese Communists and Vietcong less than four years later. (I had witnessed some of this myself, as a Saigon correspondent of The New York Times from 1969-71.) 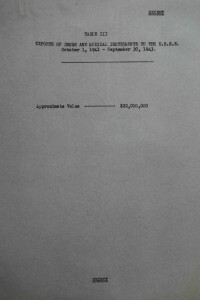 The IPA was torn too: several board members resigned in opposition to the contract. Forty years before her IPA memo, Ruth Prince’s storybook marriage ended in tragedy. 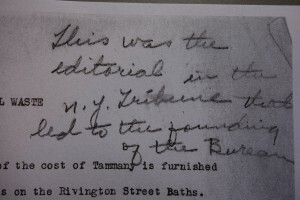 On New Year’s eve 1930, a year after the stock market crash and less than seven years after wedding Lee Adam Gimbel, a Wall Street broker and grandson of Adam Gimbel who founded the original Gimbel store in Vincennes, Ind., in 1842, she was widowed when her husband leapt from a 16th floor window of the Yale Club. Their daughter, Mary Lee, was just 4. 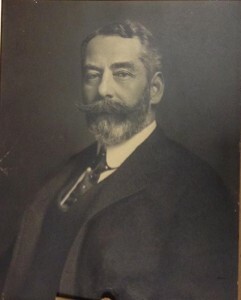 Ruth Prince soon married again, her second husband an English professor, Edward C. Mack, who would gain renown as a specialist in Victorian literature and distinguished faculty member at the City College of New York. 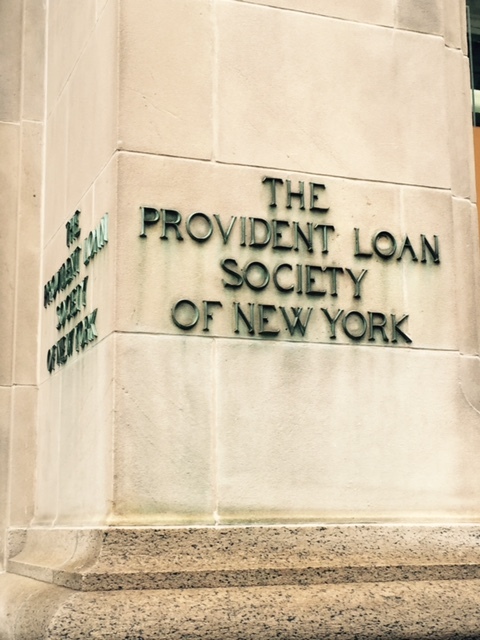 (I looked up to him there when I attended CCNY starting in 1958 –another Degree of Separation). Edward Mack, too, had been sadly widowed, by the untimely death from illness of his young wife, and was raising their infant son, John. Ruth Prince Mack became the only mother John ever really knew. In yet another grim twist of fate, Edward Mack was killed at 68 in 1973 in a car accident near their summer home in Thetford,Vt. John Mack grew up to become a distinguished psychiatrist at Harvard Medical School and a decorated author — his biography of T.E. Lawrence won the Pulitzer Prize in 1977. But a chance encounter in 1990 with a visionary artist and UFO researcher, Budd Hopkins, started Mack on a strange quest of his own — to try to fathom the bizarre stories many of his patents were telling of having been abducted by alien beings. Mack subjected them to rigorous investigation, concluding that they were not insane, deluded or fabricating — something inexplicable but indeed “real” had happened to them. What, Mack couldn’t explain. 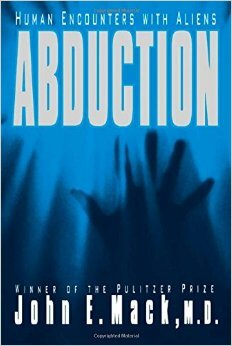 He wrote a bestseller about the phenomenon, “Abduction: Human Encounters with Aliens,” that landed him on Oprah and, given his exalted standing at Harvard Medical School, won him growing international fame — and infamy. Mortified Harvard superiors in the 1990s put him on secret departmental trial in an inquest into his scientific methods that ultimately exonerated him of any wrongdoing. 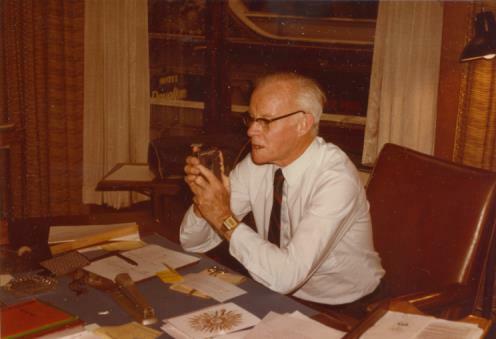 John Mack was pursuing his unorthodox research in 2004, days before his 75th birthday, when he traveled to London for a program on Lawrence of Arabia, looked the wrong way down a busy street, and was struck and killed by a drunk driver. I have been researching his haunting story ever since. But I didn’t expect to encounter his mother in the Baruch Library Archives. An Aha moment! 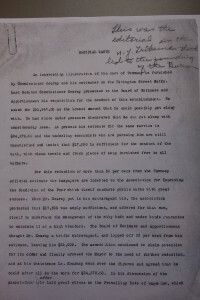 We’ve seen how the Bureau of Municipal Research came to invent a new science of honest, efficient, effective and professional government: disgusted with the cronyism of Tammany Hall, a band of New York plutocrats (names like Rockefeller, Carnegie and Harriman), came together at the dawn of the 20th century to teach New York and cities around the country the wisdom of budgeting, performance audits, investigative studies and professional training for civic leaders. 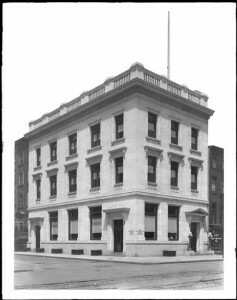 The idea of a citizen agency to monitor government had been kicking around New York for years in the late 1800s, particularly under the auspices of the New York Association for Improving the Condition of the Poor (AICP), an early influential charity that spawned the Citizens Union. 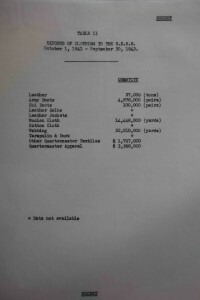 Which, in turn gave rise to the Bureau of City Betterment, forerunner of the BMR. Masterminding that movement was a wealthy and powerful philanthropist, Robert Fulton Cutting, whose story we outlined in earlier posts. 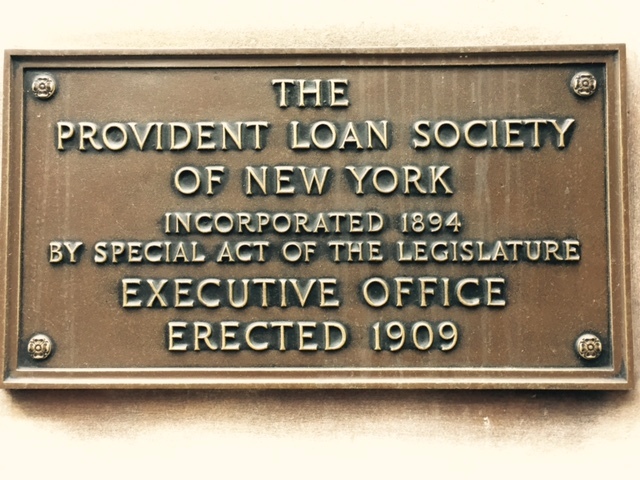 Anyway, in that March of 1901, Frank Tucker, vice president of the Provident Loan Society, read the Tribune editorial and called it to the attention of Cutting. 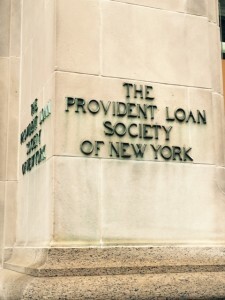 The Provident was another great reform institution, a nonprofit pawn brokerage created during the financial panic of 1893 to provide New Yorkers desperate for cash an alternative to loan sharks. 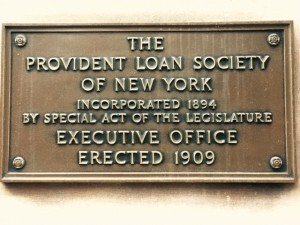 The founders included J.P. Morgan, Cornelius Vanderbilt, Jacob H. Schiff, August Belmont Jr., Salomon Loeb and Gustave H. Schwab. And its executive office, erected in 1909, was on the northwest corner of 25th Street and Fourth Avenue (renamed Park Avenue South in 1959) – a block from Baruch! It is still there. So what did the Tribune editorial say? 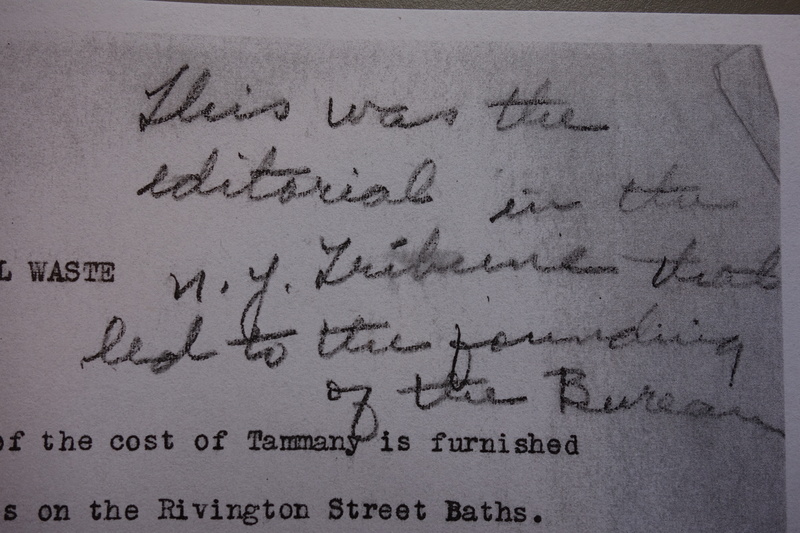 The Association for Improving the Condition of the Poor, which ran its own baths, said it could do the job for even less, $17,500. 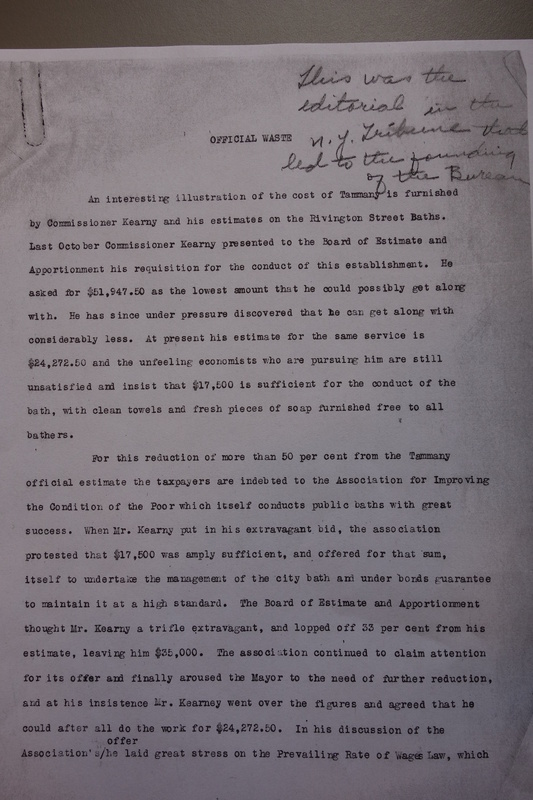 Kearny protested that the city, unlike the AICP, had to abide by the Prevailing Rate of Wages Law. 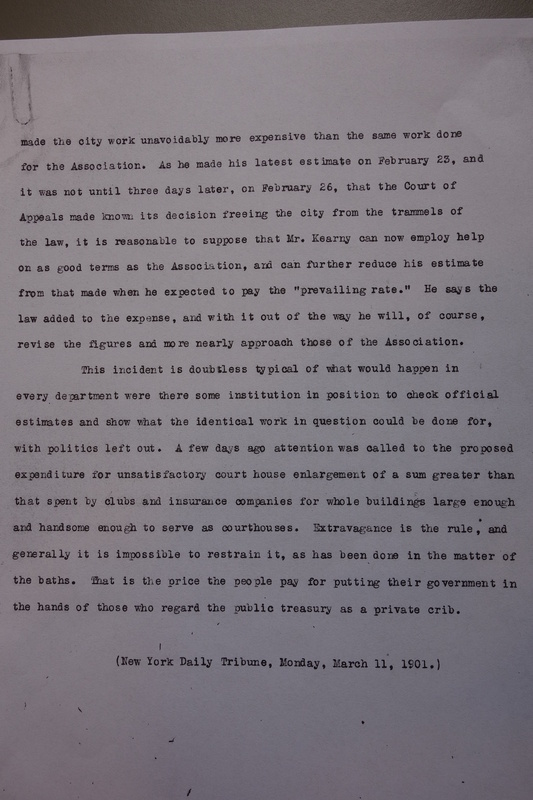 But then the Court of Appeals freed the city from “the trammels of the law,” as the Tribune editorial put it, and Kearny agreed that he could revise his figures substantially downward after all.